The Colorado String Quartet continues its recording career with a coupling of two of the most tragic and dramatic works in the chamber music repertoire. 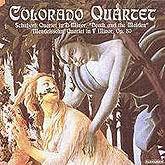 Schubert’s Quartet in D Minor, D. 8lO, Death and the Maiden is among the most familiar of all string quartets. Mendelssohn’s Quartet in F Minor, Op. 80, is a seldom-performed masterpiece. Both share the theme of death, Schubert’s in its subject matter, Mendelssohn’s in its circumstances and tone. It was the only major work Mendelssohn wrote between the sudden, shocking death of his beloved sister (and fellow-composer) Fanny and his own death half a year later. Since releasing its first Parnassus CD, the Colorado String Quartet has widened its audience with appearances at the Mostly Mozart Festival (including concerts on three consecutive days), the Bard Music Festival, and many new venues. The ensemble maintains its yearly Soundfest every Summer in Woods Hole, Massachusetts, where it performs and teaches younger groups. These are bold, expressive performances, superbly recorded. My current Schwann Opus lists 35 recordings of Schubert’s “Death and the Maiden” Quartet (not counting multiple releases of the same performance, or the many versions played by string orchestras) and only six of Mendelssohn’s Sixth (and last) Quartet. This is the first release to join the two on a single disc. Better late than never, for this is a logical coupling. Mendelssohn’s work is from the final months of his life between his collapse on hearing of the sudden death of his beloved sister Fanny Mendelssohn Henselt, and his own death. The agitated minor-key writing suggests a man preoccupied with thoughts of death, as is most certainly the case with the more theatrical D-Minor Quartet of Schubert, with its long set of variations on his popular song, Death and the Maiden. But along with this emotional coincidence is the evidence that in both string quartets, as is so often the case in the history of art, the anguish of the creative genius leads to work of superb craftsmanship as well as self-revelation. If one knew nothing of the personal circumstances of the composers, and, in the case of Schubert, had no idea whatever concerning the title or text of Matthias Claudius’s poem, the works would nevertheless claim attention and, indeed, awestruck admiration. Happily, the Colorado Quartet–Julie Rosenfeld and Deborah Redding, violins; Francesca Martin Silos, viola; and Diane Chaplin, cello–capture both the formal perfection and poetic expression of these works. They are equally at home with Mendelssohn’s ingenious counterpoint and Schubert’s unprecedented symphonic sonorities. Judith Sherman supervised the recording of these performances in the Recital Hall of the State University of New York at Purchase, the venue for many fine recordings of chamber music. Fanfare’s Leslie Gerber begin_of_the_skype_highlighting end_of_the_skype_highlighting is the impresario of Parnassus Records and the author of the musical commentary. With the full disclosure of the fact that it will earn me absolutely nothing, I urge all readers to buy one or more (think of your friends!) copies of this extraordinary disc. Sometimes I read what I have said about the Colorado Quartet and think “are they really this good?” Every time I hear them I am surprised by their playing–at just how fine a quartet they are. This recording of Schubert and Mendelssohn is every bit as fine as their Brahms recording (Nov/Dec 1997). In the Schubert they reveal their phrases bit by bit and their pacing is extraordinary. I especially like the way they play the “Death and the Maiden” song and plunge into the variations. The Mendelssohn is perfect–just the right combination of extroversion and introspection, as well as the perfect balance of classicism and romanticism. They have a real sense of freedom with a highly disciplined and highly structured sense of rhythmic movement. Their balances are beautiful, and they play with real tonal imagination and a strong collective personality that is open and welcoming. They blend with and balance each other beautifully. It is impossible to hear where one musician ends and another begins. Their playing is ideal; I have not heard a modern quartet play these pieces better.